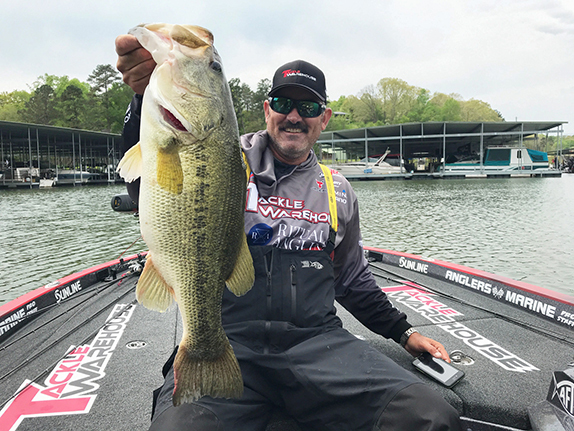 Walters tapped into his Florida-bred instincts this week, flipping for bass in grass mats on the main-river channel, a strategy that also helped him win a BFL Regional Tournament on Lake Guntersville back in the fall of 2013. 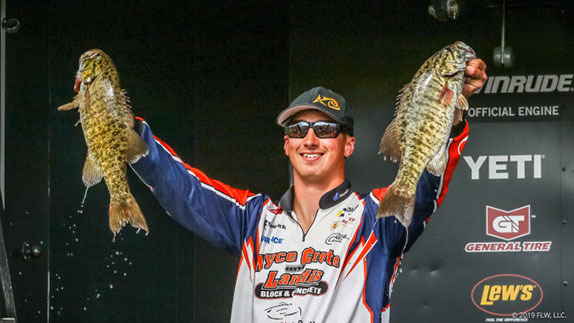 Walters said he was able to pick apart the channel-facing hydrilla in 2013, but due to recent heavy winds and high water flow washing out the outer edge, he was forced to move to the bank side of the same mats this year. �When I showed up here, I wanted something on the main river,� said Walters. �In 2013, everything was on the main-river channel, so I immediately went and looked for hydrilla there. Well, I couldn�t find it � when I pulled out of Waterfront [boat ramp] it was gone. So I went up the river � it�s what�s we do in Florida � and I looked for something. I got a few bites the first couple of hours I was here, and I said I was going to commit to it one way or the other. 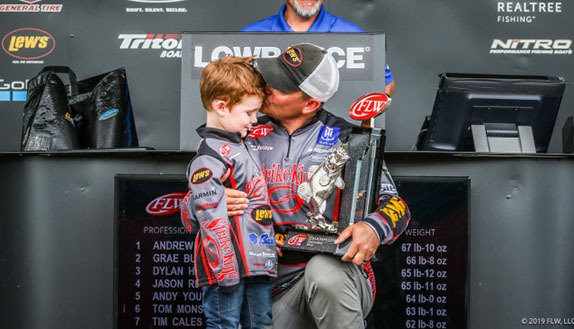 Walters had two primary areas along his stretch this week � grass mats in 4 to 5 feet-of-water about a mile above of the BB Comer Bridge, and hydrilla in 8 feet a couple of miles below the bridge. His grass mats consisted of a mix of hydrilla and milfoil. Dead eelgrass and other vegetation had blown in on top of the grass and created dead, brown mats. Walters said he used beaver-style baits, citing a green-pumpkin/black-blue Gambler Stinger. The lures were Texas-rigged with a 1 1/2-ounce Picasso tungsten sinker on a 4/0 straight-shank hook and 75-pound-test Halo Winch braided line. To hoist bass out of the vegetation, he preferred to use a Halo 7-foot, 11-inch J.T. Kenney Signature Series rod. 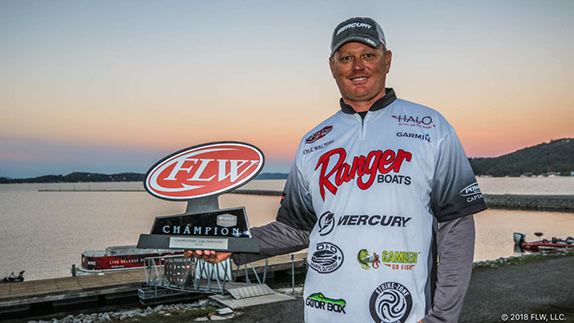 The top finishing angler from each of the six FLW Series divisions who qualified for the 2019 Cup were Walters (Southeastern), Zack Birge (Southwestern), Ryan Salzman (Central), Cory Johnston (Northern), John Griffith (Western) and Erik Luzak (International).